Toymaker Papa Foxtrot's complete space series includes Dragon, Spektr-R, ORS-1, GEOTAIL and Cygnus satellite models. The series was shown at the 110th American International Toy Fair in New York City in Feb. 2013. 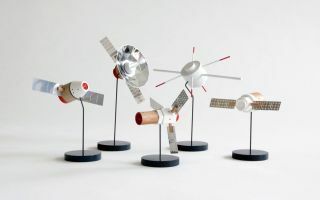 A small toy company with a penchant for design has reinterpreted the new commercial resupply spacecraft flying for NASA as desktop ornaments. London-based Papa Foxtrot has crafted wooden models of the Dragon capsule built by Space Exploration Technologies' (or SpaceX), and Orbital Science Corporation's Cygnus cargo capsules. The simplified 4-inch (11-centimeter) scale models, along with other miniature satellites in the series, are on display this week at the 110th American International Toy Fair in New York City. SpaceX and Orbital Sciences were each awarded multi-million dollars contracts under NASA's Commercial Orbital Transportation Services program to deliver supplies and equipment to — and in the case of the gumdrop-shaped Dragon, from — the International Space Station. SpaceX has already flown to the orbiting complex twice and has another mission targeted to launch on March 1. Orbital is planning to fly its first Cygnus module later this year. The Papa Foxtrot models are the first third party products to capture the spacecraft in toy form. (SpaceX previously released its own flying model rocket of its Falcon launch vehicle that was topped with a miniature Dragon capsule). The wood and aluminum Dragon and Cygnus toys are part of the company's line of space models that replicate real life satellites. The series' other sets are based on Earth orbiting spacecraft, each dedicated to different purposes. The Spektr-R model is based on Russia's radio telescope launched in July 2011. The orbiting observatory, with its 33-foot (10-meter), 27 petal dish, is used in conjunction with ground-based radio telescopes to offer an effective resolution that is more than 1000 times that of the Hubble Space Telescope. GEOTAIL, with its protruding booms, launched in 1992 as part of a collaboration between the U.S. and Japan. The satellite was sent up to observe the turbulent wake that Earth's magnetosphere pulls behind it and how the solar wind penetrates through. The last spacecraft in Papa Foxtrot's model fleet is the ORS-1, a U.S. reconnaissance satellite launched in 2011 from NASA's Wallops Flight Facility in Virginia, the same spaceport from where Cygnus will launch to the station. ORS-1, also known as USA-231, was designed to provide orbital imagery to enhance battlespace awareness. The toy version of ORS-1 has already been adopted by the squad responsible for the real satellite's operation, the Wall Street Journal reports. The Papa Foxtrot models are used as training aides and presented as parting gifts for officers.